Pudding ( was Tiffany) has been with us for a few weeks now and seems very happy with her new home! 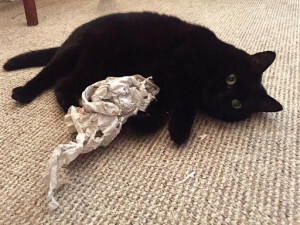 Her favourite things are lazing on her back while her belly gets rubbed, playing with her toys (and paper) and waking me up early in the morning with excessive head-bumping. She settled in within a day of bringing her home and now we couldn’t imagine not watching her run down the hall to us every time we walk through the front door. Thank you for introducing this chunky bundle if joy into our lives!